I have an iPhone 4 and use the calendar feature often. Deleting events used to be simple, but at the moment I've found that I cannot delete an existing repeating event. I can tap on the event and view the details. There used to be an "Edit" button for repeating events, where you could select to delete either one instance of the event, or all instances of the event. That "Edit" button is no longer there though, and I cannot find any other way to delete the series. Software version is iOS 7.0.4. Does anyone know how I can get rid of this? Tapping on an event should give you an edit button in the upper right. From there you scroll down to the very bottom and will see the option to delete the event(s). 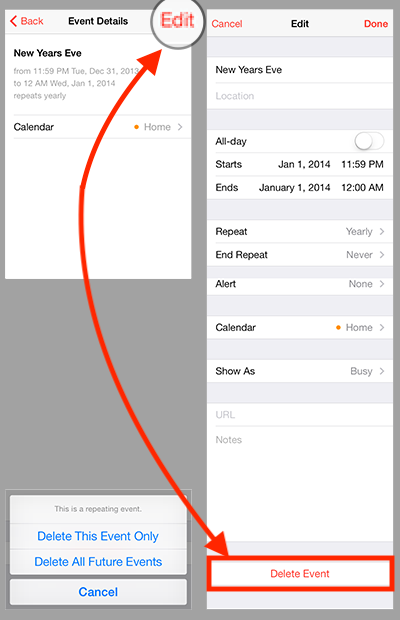 How do I show all calendar events in “Today view” in iOS 9? How do I undo an import into macOS calendar?